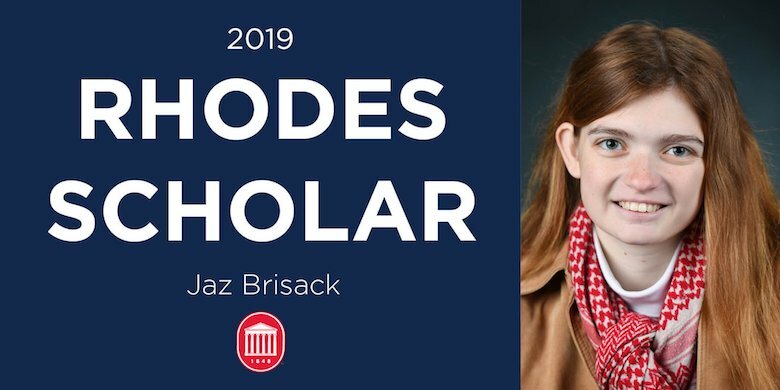 Jaz Brisack is the University of Mississippi’s 26th Rhodes Scholar, and the first woman in the university’s history to be selected to the elite international academic program. Brisack, a general studies major with minors in English, journalism, and public policy leadership, is the 2018 Truman Scholar for Mississippi and has a long history as a champion for human, civil and labor rights in Mississippi. She is president of the College Democrats and a frequent contributor to The Daily Mississippian. She has worked as a teacher-adviser for the Sunflower Freedom Project in 2016 and as a labor organizer with the United Auto Workers on the Nissan campaign. She also helps defend the Jackson Women’s Health Organization, known as the “Pink House,” Mississippi’s sole abortion clinic. She was selected after interviews with officials from the Rhodes Trust Nov. 16-17 in Birmingham, Alabama. Scholarship recipients were announced Saturday (Nov. 17). The Rhodes Scholarships, which were created in 1902, bring outstanding students from many countries to the University of Oxford in the United Kingdom. Besides “intellectual distinction,” the selection committee seeks excellence in qualities of mind and of person, which combined offer the promise of effective service to the world in the decades ahead. Rhodes Scholars receive tuition, travel, room and board, and a stipend for two years of study at Oxford University, with the possibility of being renewed for a third year. UM students Jarvis Benson and John Chappell were also 2018 finalists for the Rhodes Scholarship and competed in Birmingham with Brisack. Besides those current students, Chinelo Ibekwe, a 2018 chemical engineering graduate from Lagos, Nigeria, was named a finalist in the Rhodes Scholarships for West Africa program. She will interview Dec. 1 in her category. UM has had 25 Rhodes Scholars and many Rhodes finalists, but never four finalists in one year. Chancellor Jeffrey S. Vitter said that from last year’s Truman Scholarship to this distinction of being the university’s first female Rhodes Scholar, Brisack continues to chart a groundbreaking path of excellence. Douglass Sullivan-González, dean of the UM Sally McDonnell Barksdale Honors College, said that out of the thousands of honors students he’s met over a decade-and-a-half, Brisack is one of the top 10. Brisack is thankful for the opportunity that UM and the Honors College have provided her to work with professors who have inspired her. Journalism professor Curtis Wilkie first met Brisack when she was in an upper-level Honors College course he was teaching. He said Brisack is one of the most extraordinary students he’s ever taught. “I was astonished that she already knew virtually every book that I cited during the semester,” Wilkie said. “Aside from her excellent grades, I’ve been impressed by her passion for so many causes that are rarely embraced by people of her age.